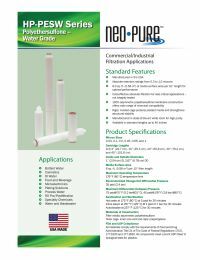 Neo-Pure HP-PESW High Purity Polyethersulfone Water Grade Membranes are manufactured in the USA in a state-of-the-art white room. They provide absolute-rated retention efficiency for high purity applications. HP-PESW Series filters are not integrity tested, making them a cost-effective absolute filtration option for less critical applications. All filter materials comply with the FDA CFR criteria for food and beverage contact and meet USP Class VI Biological Testing for plastics.